Nirmanakaya (Skt. nirmāṇakāya; Tib. སྤྲུལ་སྐུ་, tulku, Wyl. sprul sku), or 'the dimension of ceaseless manifestation', is defined as a rupakaya or 'form body' that arises from the ruling condition of the sambhogakaya and appears as the tamer of various beings, both pure and impure. Nirmanakaya through birth, such as our teacher taking birth in the heaven of Tushita as the son of the gods, Dampa Tok Karpo. Supreme nirmanakaya (Skt. uttamanirmāṇakāya; Tib. མཆོག་གི་སྤྲུལ་སྐུ་, Wyl. 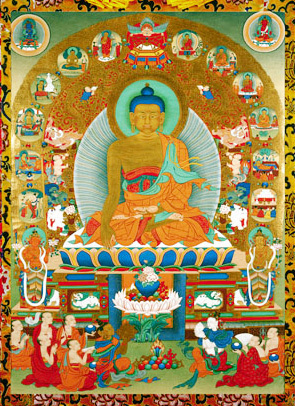 mchog gi sprul sku), such as Shakyamuni Buddha who displayed the twelve deeds here in Jambudvipa. Diverse nirmanakaya (Skt. janmanirmāṇakāya; Tib. སྐྱེ་བ་སྤྲུལ་སྐུ, Wyl. skye ba sprul sku) that manifest in order to tame various beings from Indra to a young girl. Craft nirmanakaya (Skt. śilpinnirmāṇakāya; Tib. བཟོ་བོ་སྤྲུལ་སྐུ་, Wyl. bzo bo sprul sku) such as the manifestation of the lute player in order to tame the gandharva Rabga, and as good food, bridges, pleasure gardens, and islands, as well as sculpted forms, paintings, woven images and cast metal statues. In Tibetan Buddhism the nirmanakaya is envisioned as the manifestation of enlightenment, in an infinite variety of forms and ways, in the physical world. It is traditionally defined in three ways. the third is actually a being through whom some degree of enlightenment works to benefit and inspire others through various arts, crafts, and sciences. In their case this enlightened impulse is, as Kalu Rinpoche says, "a spontaneous expression, just as light radiates spontaneously from the sun without the sun issuing directives or giving any conscious thought to the matter. The sun is, and it radiates." ↑ Sogyal Rinpoche, The Tibetan Book of Living and Dying, page 347. ↑ Kalu Rinpoche, The Dharma (Albany: State Univ. of New York Press, 1986), page 59. ↑ Sogyal Ripoche, The Tibetan Book of Living and Dying, page 355. Khenpo Ngawang Palzang, A Guide to the Words of My Perfect Teacher, Shambhala, 2004, pages 103-104. This page was last edited on 30 August 2017, at 19:01.